Women on the Land: Going Up! Hope you are enjoying the month of Sivan as much as I do. It is filled with lights of Torah and ripening fruits. B”H it has also been filled with weddings. 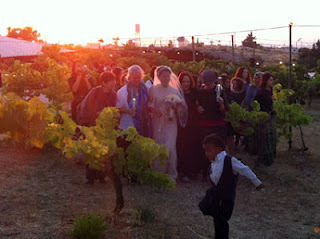 One of our part time students Shoshana got married in Bat Ayin surrounded by grapevines under the full moon Monday night, it was surreal! This week’s parasha is about lighting the eternal lights. It’s name Beha’alotcha means when you go up! This parasha celebrates the twentieth anniversary of when my husband and I with our oldest son went back up to the Land of Israel, directly from Memphis, TN to Bat Ayin! So this parasha is especially endeared to us. One of my favorite women in Tanach – Miriam appears in this week’s parasha. Moshe cried out to Hashem to heal her with the shortest most beautiful prayer. Read my Parasha Meditation to learn about the healing power of this prayer and begin to use. זָכוֹר אֵת אֲשֶׁר עָשָׂה יְדֹוָד אֱלֹהֶיךָ לְמִרְיָם בַּדֶּרֶךְ בְּצֵאתְכֶם מִמִּצְרָיִם: (דברים כד:ט). Miriam was afflicted with צרעת (Tzara’at) because she tried to correct her younger brother, Moshe, and help set his relationship with his wife straight. “Miriam and Aaron spoke against Moshe…” Rashi explains that Miriam opened the conversation. As the initiator, she had more responsibility for the act. Although she had the best of intentions: to alleviate the injustice inflicted upon Moshe's wife, nevertheless, her words of sisterly advice were considered lashon hara (evil speech) and she was punished with the plague of tzara’at. The fate of Miriam is included in the six remembrances, which we are supposed to recall every day. As soon as Miriam began breaking out in tzara’at, Moshe poured out his heartfelt prayer to Hashem for her healing: “Moshe cried to Hashem, saying, O G-d please heal her.” – “אֵל נָא רְפָא נָא לָהּ” This prayer is the shortest in the Torah and easy to learn and use. It consists of only five words with a total of eleven letters. These eleven letters correspond to the name G-d revealed to Moshe at the burning bush: “I will be what I will be.” (אֶהְיֶה אֲשֶׁר אֶהְיֶה" (שמות ג:י"ד". This sentence of reassurance asserts that Hashem will always be with us in each and every exile. Just as the burning bush is not consumed, so will neither exile nor illness have any power to consume the Jewish neshama. Moreover, this name of G-d has healing powers. Rabbah said: Seafarers told me: “The wave that sinks a ship appears with a white fringe of fire at its crest, and when stricken with clubs on which is engraved: ‘I am that I am, Yah, the Hashem of Hosts, Amen, Amen, Selah’ – “E-heye asher E-heye, Y-ah, Hashem Tze-vaot…” – אהיה אשר אהיה יה ה' צבאות אמן אמן סלה – it subsides. Perhaps the name “I will be….” has such healing powers, because healing take place as long as we have emunah and hope for the future. Make yourself comfortable wherever you are. Close your eyes. Feel connected, with your feet on the earth, your head upright, your chest expanded. Feel Hashem’s lifegiving breath circulating within you, as you breathe slowly and deeply through your nose. Filtering the air and taking in cleansing breaths, and inhale Hashem’s light to every fiber of your being. Breathe in, imagine and pronounce the name “K-El – alef, lamed,” giving you strength, breath out, ask Hashem “please! Na – nun- alef.” Repeat four more times. Now inhale as you ask Hashem “please heal” – “refa na – reish, peh, alef, nun alef.” Then exhale pronouncing the word “lah – lamed heh” as you focus on a particular part of your body that needs healing, a place that may be painful. Tune into the pain as you pray “lah” bringing light into the pain, lifting the pain to be part of a greater future where this pain has served its purpose. Each time you get up the last word of the prayer “lah” which means “her,” focus in on a person or a body part where you want to bring Hashem’s healing. When you are ready shake out your hands and feet out and open your eyes. You may practice this simple powerful healing prayer spontaneous whenever you meet someone who needs healing. The grandson of the Ba’al Shem Tov, Rabbi Moshe Chaim Ephraim explains that from this prayer that Moshe prayed for his sister Miriam there is an allusion to the custom when praying for someone sick to mention the name of the sick together with his or her mother’s name. The words רפא נא – refa na – “heal her please” from Moshe’s prayer has the numerical value of 332 the exact same numerical value as the name of Miriam together with the name of her mother Yocheved. 6. Sanctifying the Shabbat שש זיכרונות, סידור אשכנז, ספרד ועוד. A spiritual skin disease usually mistranslated as leprosy. Babylonian Talmud, Baba Bathra 73a. Degel Machane Efraim, Parashat B’Ha’alotcha. The word “Refa רפא ” equals 281, the word “na נא ” equals 51 totaling 332. The name Miriam מרים equals 290, the name Yocheved יוכבד = 42 totaling 332!